Use raw chickpeas and make them yourself. Follow the directions on the bag. Don’t use canned. 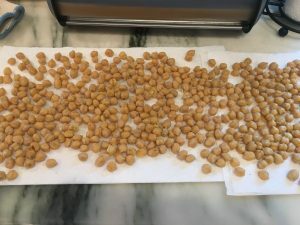 Air dry the cooked chickpeas for a couple of hours on paper towels. 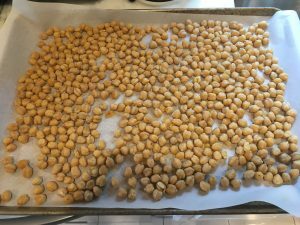 Be sure to roast the chickpeas in a single layer on a baking sheet lined with parchment. Turn off the oven. 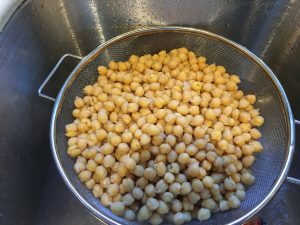 Leave the cooked, mixed chickpeas in the oven overnight. 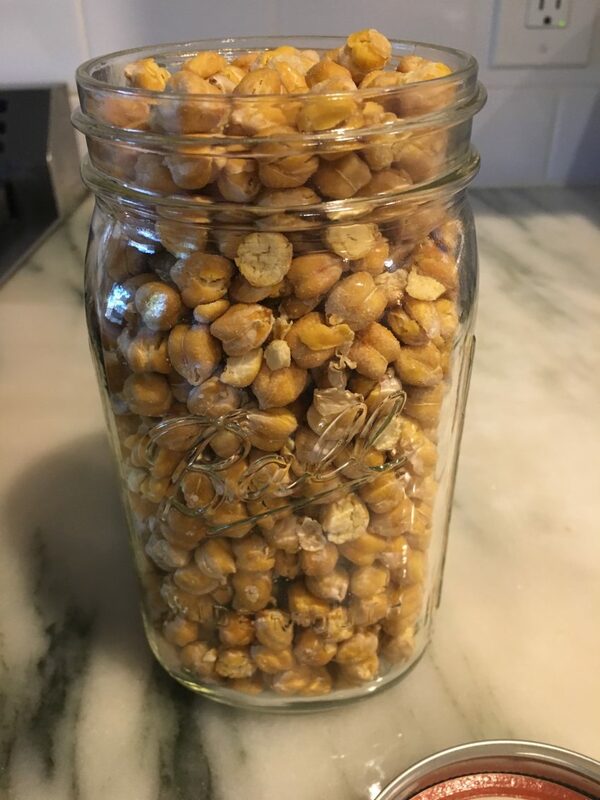 Allrecipes.com had the best recipe (I thought) to use as the base for my dried chickpeas. The recipe is here. As I said I tweaked the recipe. Start with one bag of raw chickpeas and cook according to the directions. 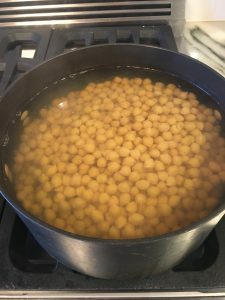 I use the quick soak method and then I cook the chickpeas on the stovetop. I lay all of the cooked chickpeas out on paper towels, in a single layer. Then I let them dry for about two hours. I transfer them to a large baking sheet lined with parchment paper – in a single layer. Then I follow the allrecipes recipe for cooking. 400 degrees. 40 minutes. Shake every 10-15 minutes. Turn off oven when the cooking time expires. When they are done, I use the parchment paper as a slide to transfer the chickpeas to a large mixing bowl. I use my olive oil sprayer to spray the chickpeas with olive oil and liberally sprinkle with salt. Mix. Taste. (I usually have Steve taste test for me since he has much higher salt tolerance than I do!). When they are to our liking, I spread them back out in a single layer on the used parchment paper on the baking sheet and return them to the oven. Leave them overnight in the oven (yes, the oven is off). Then wake up to perfect chickpeas! Easy, right? And delicious! Store your chickpeas in mason jars.